Greg Hibner receives his 20-year recognition while at the USGC's 58th Annual Board of Delegates Meeting in Denver. Whenever Greg Hibner heads to Elite Octane, the local ethanol plant, he slips on the Redwing work boots his father left in almost-new condition when he passed away. A construction general foreman nicknamed “The Beast,” Hibner’s dad struggled through the 1980s as a farmer and a pipe fitter/welder in northern Illinois. Hibner said his father would have been at home in an ethanol plant and proud of both the tremendous growth in the farming industry and of his son’s activities trading corn co-products around the world. 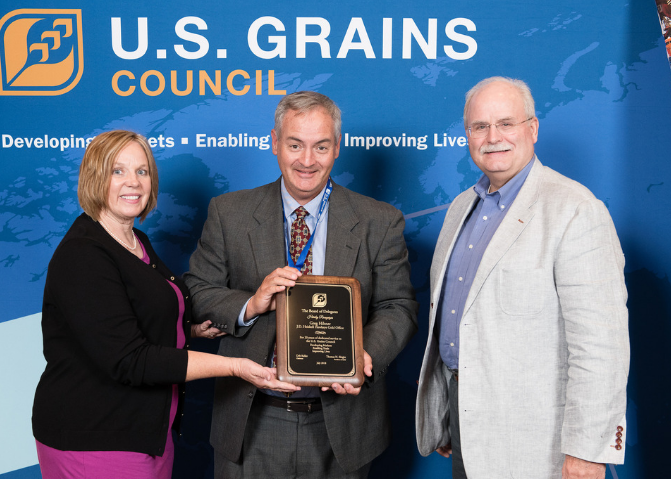 Hibner was recently honored for his 20 years of service to the U.S. Grains Council (USGC) at its 58th Annual Board of Delegates Meeting, held this summer in Denver. In addition to owning farms in Illinois, Iowa and Arkansas, Hibner has more than 30 years of experience in commodity processing and international trading. In his current role with Hawkeye Gold, part of J.D. Heiskell, his team primarily markets and trades distiller’s dried grains with solubles (DDGS). Prior to Hawkeye Gold, Greg worked for Tate and Lyle trading corn gluten feed and corn gluten meal, handling a million tons of feed-related trade each year domestically and into Europe, Indonesia, Thailand, Japan, Chile, Norway, Mexico, Israel and other countries. Hibner started working with the USGC during that international experience with Tate and Lyle. He recalled talking about corn wet milling products in Southeast Asia, which served to emphasize the importance of relationships to making trade happen. Hibner said he still has international customers stop by his farm, laughing over old stories and recalling trade disputes now settled. He remembered one large Chinese customer came to the farm after a trade dispute made a contract unfillable. They sat together in his machine shed and, in four hours, negotiated something palatable to both sides. “I have learned that people have different customs, different views, but at the end of the day, they are all just people,” he said. Throughout his time involved in the Council, Hibner has worked to share that personal perspective and his professional experience by traveling abroad, serving on different Advisory Teams and representing the agribusiness sector on the Council’s Board of Directors. “The Council has helped tie together the enjoyable part of the job,” Hibner said. “My life is very commercial – I’m buying and selling and loading and shipping. The Council has allowed me to have a broader view and put on a hat as a farmer and someone who is pro-trade.